Amazon Japan, who has not been able to launch its long-awaited e-book reader/platform Kindle for years, leaked something related with Kindle on its website around September 3, just a couple of days before US Amazon’s press event planned on September 6 (7th in Japan timezone). According to a blogger ArtSalt [J], the link appeared fist at 2-channel [J], an huge anonymous bulletin board service. At around 3 a.m. September 4 (Japan Standard Time), an anonymous 2-channel user posted, “(New) Amazon Kindle will be sold on September 7 in Japan”, then on the following comment, s/he posted a link pointing a page on Amazon Japan. When the link was posted on 2-channel, the page showed several “English” digital books with the page title including “Kindle Store” (Store was in Japanese). As Amazon has different contents in each countries, and the page’s domain was amazon.co.jp, that page and other pages linked from it were the pages for Japan. Those pages were quickly taken down but you may see some on Google cache. There are several English e-books there but no Japanese titles. And the number of those English books are less than 20. 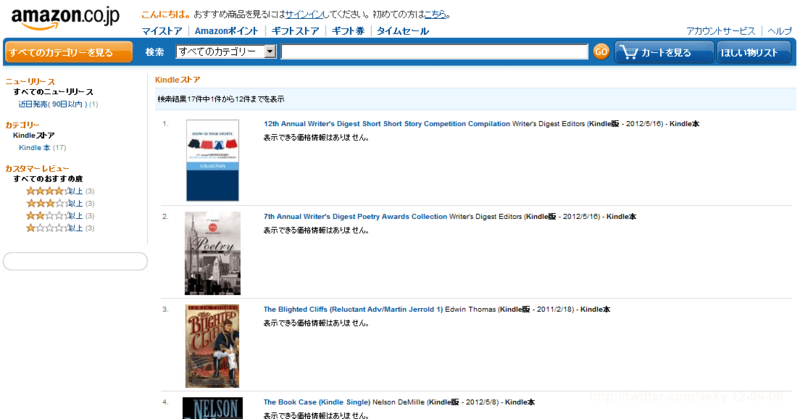 So 2-channelers said that the page might be a testing page for Kindle device in Japan for Japanese market. If that is their final test as 2-channelers guessed, new Kindle and Kindle Store will hit Japan as well as US and other countries who already enjoyed Kindle. However, as they should see Rakuten Kobo’s launch troubles around Japanese language issues, testing it without Japanese e-books is unlikely if their launch involves Japanese language e-books. Test all with English e-books may mean that Amazon Japan gave up launching Kindle for Japanese language readers for this time, but starts it for English readers living in Japan at this timing when Amazon globally releases new model of Kindle.